How do I use the "outofstock_block" feature? 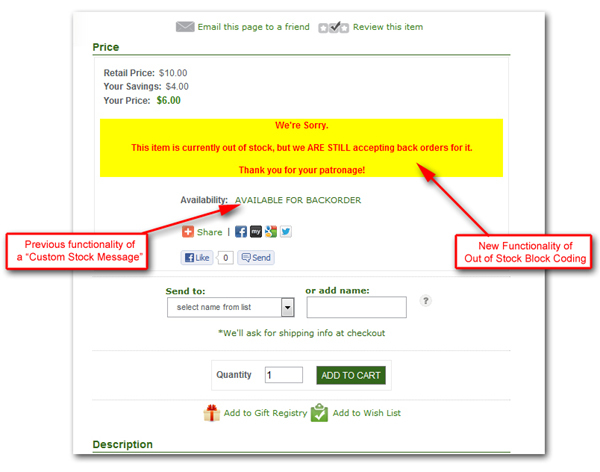 The "outofstock_block" feature is intended to allow merchants to automatically display a robust and HTML-rich message to their shoppers when the item's stock level reaches 0. This new feature is not to be confused with the custom "Stock Message" function described in this KB article, which only allows for a simple custom line for your product's individual availability. Instead, this new feature will allow you to display actual HTML elements to the product listing page dynamically when the product's inventory reaches zero. Also, please bear in mind that this new function is intended for base product inventory and will not work for advanced options inventory. To use this new outofstock_block feature, you will simply need to add the following code to your specific HTML listing template(s). As always, please be sure to make backups of your HTML templates before attempting to make any types of edits. Technical Support will not be able to help troubleshoot or consult on design aspects being as HTML design is outside of our scope of support.